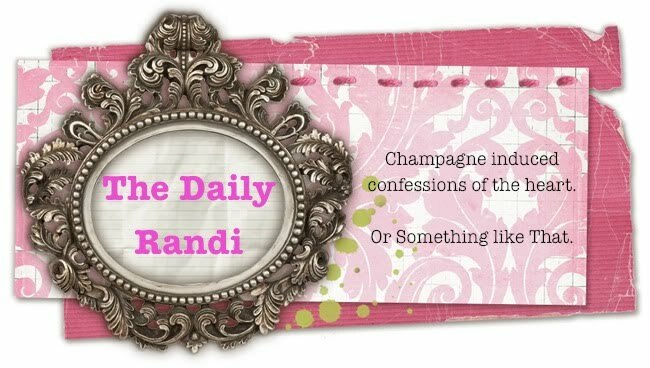 The Daily Randi: No More W(h)ining! I finally broke My Other Wine Glass. I guess that means The Anti-Feng-Shui Curse is Broken. In case you don’t recall, I always kept Two Wine Glasses on hand, because Someone Once Told Me/I Read In Real Simple Magazine that it was always important to Be Prepared For Company/Cute Boys. But, most of the time, I just made use of One, Single Glass. The Other Glass just sat, Unused, in my kitchen cabinet. Then, I accidentally broke One Of The Glasses, right when I found myself in A Relationship. I considered that Good Luck. And so, I developed Anti-Feng Shui and I refused to Buy A New Wine Glass! I would live with just One Single Glass! Well, Part Of Breaking The Curse was that A New Glass could be Purchased For Me. Except, I never got A New Wine Glass. Despite lots and lots of Hints. Me: Totally Awesome Boyfriend would you like A Delicious Glass Of Wine? Totally Awesome Boyfriend: Why, Yes, The Daily Randi! A Delicious Glass Of Wine sounds quite refreshing! Me: Great! Let me get that Delicious Glass Of Wine for you. But, wait! I forgot – I only have One Wine Glass! If only Someone went to Crate and Barrel and purchased me A New (Only $3.95) Wine Glass! Whoa, is me! Totally Awesome Boyfriend: Oh, I don’t care, The Daily Randi. I will drink My Wine out of This Ceramic Coffee Mug instead! And, so it was inevitable that The Single Glass should Break. And Good Riddance, say I! It had Perfect Timing. I haven’t sipped from The Proverbial Single Glass in months! Plus, I really had My Eye on These Olive Tinted Wine Glasses that I just saw in The Crate and Barrel Fall Catalogue and I read in Real Simple Magazine that Olive is The New Amber. I was Free to get myself A Matching Set, Not Worry About A Curse, and be Super Trendy!! And The Best Part is that I know I will actually make use of Both Glasses! Now, If only I can break Totally Awesome Boyfriend’s Habit of Drinking Wine out of A Ceramic Coffee Mug. I used An Evil Yankees Mug because it is Totally Awesome Boyfriend's Wine Glass Of Choice. See???? Get it???? Totally Awesome Boyfriend likes The Yankees! Not Me!!!! Ok - I'll give you that -- but to even have said Yankee mug in your house....don't the existence of such things cause vermin to infest? I have heard rumors to the such.